MANILA, Philippines - Students of the University of the Philippines Los Baños (UPLB) have decried on social media the enrollment process fiasco brought by the newly implemented enlistment system called Student Academic Information System (SAIS) for the First Semester of the Academic Year 2016-2017. 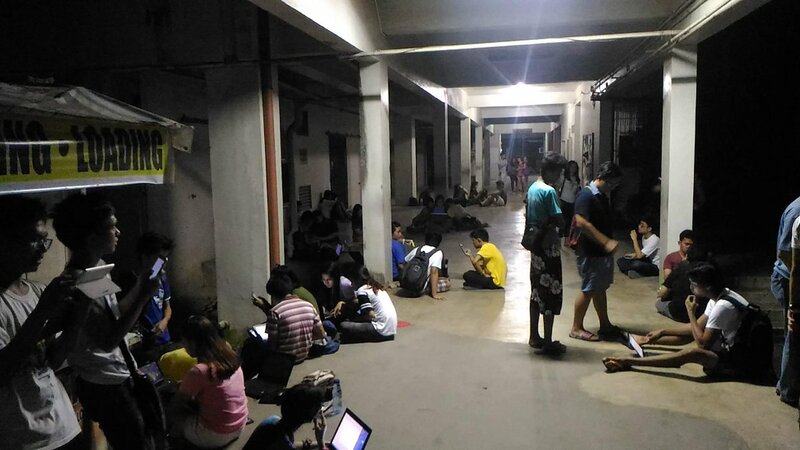 On Saturday, 'UPLB' has trended on Twitter to voice out the current situation on accessing the system with hundreds of students were forced to camp out just to enlist subjects. "This was supposed to be an online registration but the site is only accessible within UPLB," said one of the students. The enlistment for UPLB has started on July 28 for graduate and graduating students, July 29 for regular and July 31 for other students. It is scheduled to end on Tuesday, August 2. 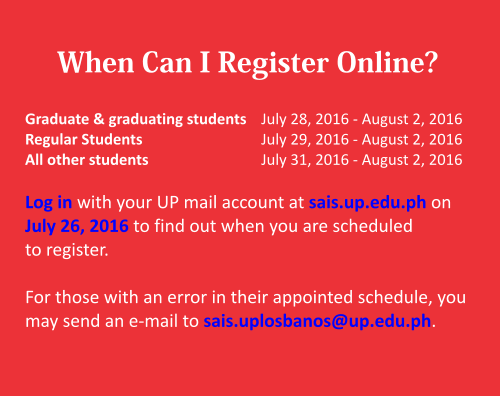 Check out #UPLB SAIS reminders and procedures here. The Student Council of UPLB (USC) has released its official statement against the UPLB SAIS enrollment that allegedly resulted to one of the grandest fiasco across the entire UP System. The eUP project's SAIS was also been implemented in Manila and Baguio branches and soon on flagship campus in Diliman, Quezon City under the initiative of UP President Alfredo Pascual. "During the scheduled date, the SAIS online portal remained inaccessible to a vast majority of students who are in dire need of units to be enrolled. The blame, of course, resides in the weak infrastructure architecture and poor overall implementation of eUP--the project touted as the Pascual administration's pièce de résistance." According to USC, the administration did not revealed the contigency plans in case of system failures. "The Office of the University Registrar (OUR) stood firmly that contingency plans will not be disclosed, and promised that problems will be fixed by the SAIS Team for a smooth enlistment of subjects." SAIS is one of the five component system of the eUP. Flaunting the theme of "One University, One UP." Report said that the cost of the project soars to nearly one billion pesos. The platform was developed by Oracle, a large American multinational IT company and powered by ePLDT. Students decry the utter wreck the enrollment process has become. The general registration for the First Semester of the Academic Year 2016-2017 in the UP Los Baños, UP Manila, and UP Baguio has resulted to one of the grandest fiasco across the entire UP System. During the scheduled date, the SAIS online portal remained inaccessible to a vast majority of students who are in dire need of units to be enrolled. The blame, of course, resides in the weak infrastructure architecture and poor overall implementation of eUP--the project touted as the Pascual administration's pièce de résistance. Students are left in a disarray with no idea how to proceed with the new registration process; while the administration is adamant on the idea of a contingency plan for the failing system. Last week, the University Student Council (USC) submitted its request to the administration regarding its disclosure of the contingency plans just in case the system fails. However, the Office of the University Registrar (OUR) stood firmly that contingency plans will not be disclosed, and promised that problems will be fixed by the SAIS Team for a smooth enlistment of subjects. The Student Academic Information System or commonly known as SAIS is one of the five component system of the eUP. Flaunting the theme of "One University, One UP", the development of an enterprise resource planning (ERP) was seen by the Pascual administration as the cornerstone because of the supposed ease of different administrative process done through an integrated digital infrastructure. While the University is marred with buildings and facilities as old as the Second World War, the cost of such project soars ever upward to one billion pesos. This begs the question of what the priorities of the Pascual administration should have been. In itself, the project has been downright opaque. No financial statements were ever released for the stakeholders to scrutinize. The administration chose a licensed proprietary platform developed by Oracle--a large American multinational IT company, and powered by ePLDT. Questions such as why a proprietary platform was used remains unaswered. Contrary to what the administration claims, closed-source platform actually restricts interoperability as files and databases are kept in proprietary format. In view of the balooning expenditures of the University coupled with the dismal appropriations made by the government to UP, it's no-brainer that the savings could have been accrued if the administration opted for an open-source platform instead. Homegrown platform like the SystemOne delivered a satisfactory job when the registration comes. It is worth noting that the system operated under a miniscule budget in comparison to eUP. SystemOne progressed through time through the careful supervision of Professor Duldulao and Bulalacao along with the different student-developers. Indeed, SystemOne was the pride of the University community for its collaborative character and the optimization of the registration process. In contrast, during the trial runs of SAIS, students were appalled by the seemingly unintuitive process of registering for a course. Problems such as the lack of support for cross-platform usage and the seemingly outdated user interface of the system were registered. To the dismay and anger of the many, it was only the tip of the iceberg. SAIS swiftly changed the already bureaucratic processes in the University into an even more maddeningly complicated process. This instance alone belies the administration's claim of simplifying and harmonizing operations. To date, many students are left without any units enlisted even though they are in good scholastic standing. Some of the students are unable to go through with the registration because of the holds placed in their accounts due to some unsettled accountabilities. In line with this, All Student Councils Assembly (ASCA) of the University of the Philippines Los Baños firmly stands that Student Academic Information System (SAIS) should be junked for this is a manifestation of disservice to the student body, and this is a system brought by the Pascual administration that further perpetuates commercialization of UP education, and disenfranchises the right to education of every Iskolar ng Bayan. We are calling the students to forge unity amidst the fiasco and struggle as the University of the Philippines has been the bastion of activism since the time the students realized the needs to build a stronger foundation of nationalism and liberty during the American era. In this plight, we are calling for the active involvement of individuals, and various organizations in the upcoming mass actions in completely junking SAIS for it is not the real need of our university; instead we are calling for a full state subsidy, and the ending of commercialization of education. NO TO COMMERCIALIZATION OF EDUCATION! ASSERT FOR FULL STATE SUBSIDY! HOLD THE PASCUAL ADMINISTRATION ACCOUNTABLE! In light of the recent rescheduling of enrollment due to SAIS downtime, we take full responsibility. We understand the gravity of the situation, and we empathize with everyone’s frustration. It seems our team and partner ePLDT’s efforts to remedy the situation did not meet your expectations, and for that, we sincerely apologize. You, the University's staff and students, are UP's most valuable asset. No one is more regretful for this lapse than we are as implementers of this system. However, we stand by the belief that with its continued use and your support, SAIS will improve and scale greater heights of quality, reliability, and operational efficiency. Rest assured that we, the eUP Team, SAIS Team, the administration of UP Los Banos, and ePLDT are all doing our best to resolve issues in the system as soon as they are detected and reported. We are also continuously attending to all support requests received through our official channels. 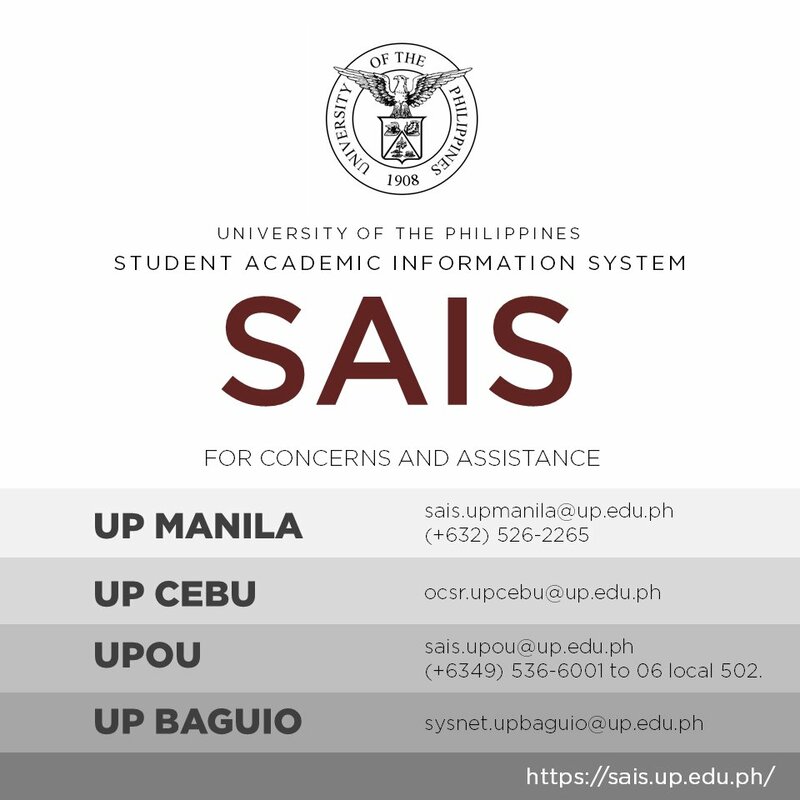 Should you wish to report any issues or concerns, you may contact the UPLB SAIS Team at sais.uplosbanos@up.edu.ph or call (049) 536-2426 / 536-2553. In the meantime, please refer to official advisories from the UPLB SAIS Team. We enjoin all stakeholders to recall that our ultimate goal is to improve all institutional processes that the student must undergo during his or her stay in the University - from admission to graduation. In line with this, we encourage everyone to lend their support in pursuit of this goal. We are grateful for your continued patience and understanding as you bear with us through this challenging time.